Psychosocial and health-related assessment tools are important vehicles on which the development of health science research is founded on. There has been a strong emphasis on the importance of their interactions within illnesses throughout the history of health care evolution. As a matter of fact, health was defined as being "a state of complete physical, mental, and social well-being and not merely the absence of disease or infirmity" upon the establishment of the World Health Organization (WHO) back in 1948. This was further reiterated in the Ottawa Charter for Health Promotion in 1986 by the WHO as to re-consolidate that health is "a resource for everyday life, not the objective of living. Health is a positive concept emphasizing social and personal resources, as well as physical capacities." Therefore, the intimate relationship between psychosocial and physical health in well-rounded medical care and health promotion has always been recognized as an essence of the art of medicine in addressing to the people's actual needs. Modern medicine would not be complete without any one of the psychosocial and health components mentioned above. Yet based on the differences among the social norms and cultural practices within global societies, assessment tools with regards to psychosocial and health-related issues are variable according to different time, place, and people. Even though the common ultimate goal of these assessments are to understand the social, mental, and medical needs of a society in a systematic and reproducible fashion, the coupling of these tools with other health promotional programs are quite delicate and sensitive. The appropriate applications of these tools are the key to achieving efficiency, effectiveness, and equity in subsequent projects and programs that can target the medical needs of any community. Well-rounded tools can even address to both the short and long term needs of any society. The purpose of this book is to illustrate what are some of the most up-to-date psychosocial and health-related assessment tools that are tailor-made for the developing Chinese society to address to the health needs of her people. Being a country consists of slightly over 1.3 billion people with 56 ethnic groups and 22 provinces, the cultural and social diversity amongst Chinese themselves are tremendous. Appropriate pairing of both psychosocial and health-assessment tools with subsequent health promotion and health education programs would address to the needs of the targeted population with greater efficiency, effectiveness, and equity. This book starts with a didactic description of different assessment tools as applied to different exemplary situations in China and ends with a comprehensive analysis of how these evaluation tools are suitable for the changing health needs of the Chinese communities. It paints a picturesque view of how a situation should be assessed before the commencement of subsequent health related projects to maximize the benefit of any program. The ultimate goal is to streamline healthcare research that would be applicable to a patient-oriented health system. This book is intended for psychologists, sociologists, epidemiologists, biostatisticians, health services researchers, and public health professionals, as well as students in these fields who are interested in learning more about quality psychosocial and health-related assessment tools. This will be one of the first few books which target on the psychosocial and health-related assessment tools suitable for the Chinese society today. Not only will this book demonstrate how and when to use different evaluation tools based on different setting approaches, the most currently social and behavioural theories will also be discussed as to provide insightful evaluation towards the health needs of different ethnic groups. Illustrative examples will garnish the educational and didactic information presented. Written by passionate health educators in the fields of Medicine, Epidemiology, Biostatistics, and Public Health, this book is truly a gem in the field of health medicine research with historical value. The development of Psychological and Health-related assessment instruments has had a long history since the late nineteenth century. James Cattell laid the foundation for the specialised area of psychological assessment within the study of Modern Psychology by suggesting the establishment of the "Mental Test". In 1895, Alfred Binet applied a scientific approach to evaluate the properties of the assessment on intelligence he had designed and effectively developed the specialised area of study now called Psychometrics. Since then many assessment tools have been designed for use in clinical practices as well as research. It has been estimated that there are more than 100 different psychological tests or assessment instruments developed and commonly used internationally and the number is growing. These instruments have been studied with rigorous scientific methods for their psychometric properties. Most of the well-established instruments have been designed and developed within the Western culture, and many have been translated into multiple languages with proper translation procedures. To ensure the usefulness and efficacy of these translated instruments, psychometric properties including reliability and validity are usually evaluated with a reasonable sample size of intended users of these instruments. For example, the Achenbach's Child Behavioural Checklist (CBCL) and related behavioural assessment instruments have been translated into 85 different languages including Chinese. Studies have demonstrated that the Chinese version of the CBCL, Teacher's Report From (TRF), and Youth Self-Report (YSR) are reasonably test-retest reliable with Intraclass Correlations ranging from moderate (0.66) to good (0.87). However, there are short comings in these translated instruments. For instance, the above-mentioned tools are found to be lacking in validity with low sensitivities. There have also been concerns that certain items and/or subscales of the CBCL (Ages 6-18) are not applicable to Chinese families as indicated by a high non-response rate on these items according to anecdotal information. Health professionals in China have been designing Psychological and Health-related assessment instruments with a special focus on their suitability to be used in the Chinese cultural context in recent decades. The design of these instruments has taken into consideration the philosophical, cultural, and psychosocial aspects of the modern Eastern mind. These instruments have been developed following proper procedures with rigorous scientific methods and their psychometric properties have also been evaluated. The aim of this E-book is to introduce some of these newly designed and developed instruments to the international arena of Psychological and Health-related assessments. Chapters included in this volume have been structured intentionally to follow the development stages across the human life span from early childhood to old age. Chapter 1 presents results on the validation of the Child Behaviour Scale Chinese (CBSC) by Wan and Lam. It has been demonstrated that this scale can be used for children as young as 2.5 years old with good validity and reliability. With the rapid development of the Internet in recent years, Problematic Internet Use has become a new kind of mental health issue with a growing prevalence, particularly among young people in the Far East region. In order to better understand the problem, Zhou et al. reported the development of the Internet Behaviour Questionnaire specifically for adolescents in Chapter 2. The questionnaire is designed to assess their usage of the Internet and the related affects and perceptions. Chapter 3 describes the design and development of the Negative Perfectionism Scale (ZNPS) by Zi and then followed by his Positive Perfectionism Scale (ZPPS) in Chapter 4 as a continuation of his previous work on the topic of Perfectionism. Work is an important part of human life and the major work force in most metropolitan cities are white-collar workers. With the recent Global Financial Crisis, white-collar workers are facing tremendous pressure and their mental health is significantly affected. It is timely for the development of the City Worker Mental Health Scale (CWMHS) by Deng as a validated instrument for measuring different aspects of mental health among white-collar workers. Chapter 5 reports the details of its design and development. Chapter 6 presented the development of the Chinese Workplace Bullying Scale which aims to assess various aspects of workplace bullying behaviour in the Chinese workplace context. Chapters 7 and 8 are related to another important stage of human life: marriage. These two chapters present results obtained on the validation of two assessment tools that aim to measure two related, yet distinct, constructs in marriages: the pressures experienced by married couples and the quality of their marital life. In Chapter 7, Li and Wu report on their study on the formulation and development of the Marital Pressure Scale (MPS), specifically for couples living in cities. On the other hand, Cheng et al. 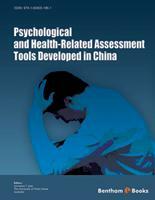 present the validation process of the Chinese Marital Quality Inventory (CMQI) and the psychometric results obtained. Both instruments are suitable for assessing the marital quality of adults from an Asian background. Chapter 9 is devoted to the issue of cognitive abilities across life span. The Chinese Cognitive Abilities Scale (CCAS), designed and developed by Cheng and his colleagues, aims to provide a practical and cultural sensitive instrument for assessing intelligence among Chinese people. In the final chapter of this volume, Cheng et al. tackles the issue of assessing the growing world-wide problem of ageing and dementia among the elderly. Chapter 10 reports the conceptualisation of dementia and the design of the Dementia Screening Inventory for Elderly (DSI-E) that aims to be used in clinical settings. I would like to express my sincere thanks to the co-editors, Prof. Shi-jie Zhou, the Editor-in-Chief of the Chinese Journal of Clinical Psychology, PR China, and Dr. Guo-Bin Wan, the Chief Child Psychiatrist of the Shenzhen Women and Children's Hospital, Shenzhen, PR China. Without their help this book would not be possible. I would also like to thank all contributing authors for their generosity in submitting their work to be included in this volume. The efforts of Ms Celia Lam, who has spent many hours proof reading the manuscripts carefully and meticulously, have ensured the accuracy and readability of the volume. I am very thankful for her hard work. Last but not least, I would like to convey my gratitude to Prof. Joseph Tak-Fai Lau, Head of the Division of Health Improvement, School of Public Health and Primary Care, The Chinese University Hong Kong, for writing the Forward. Joseph is a colleague, a friend, and a constant source of encouragement. The editor and co-editors would like to thank Bentham Science Publishers, particularly Manager Asma Ahmed, for their support and efforts.